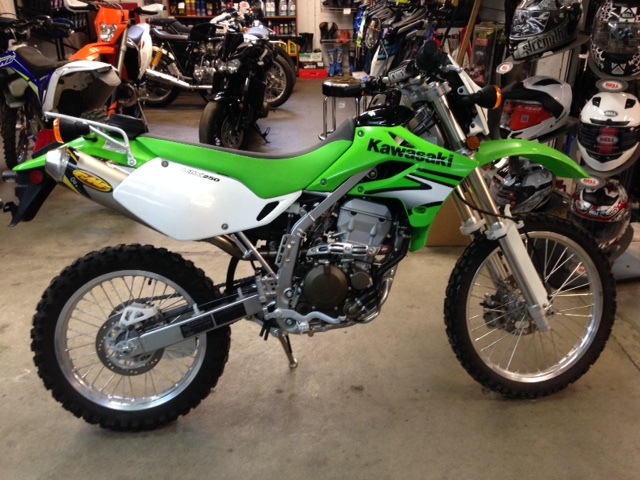 KAWASAKI KLX™250S IS THE ULTIMATE LIGHTWEIGHT DUAL PURPOSE MOUNT. Ultra-nimble 250 offers outstanding balance for trail riding. 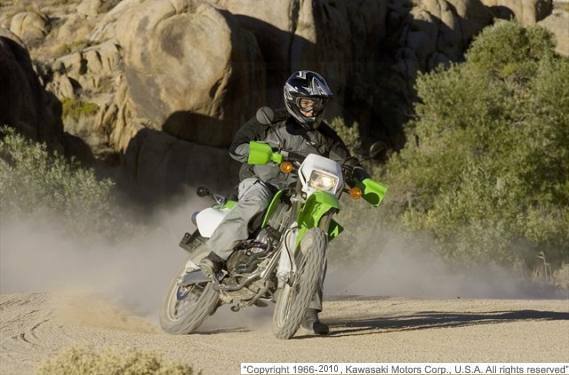 For those seeking go anywhere off-road capabilities in a street legal motorcycle, Kawasaki's KLX™250S is equally at home on the pavement as when the riding terrain calls for enduro-like performance. 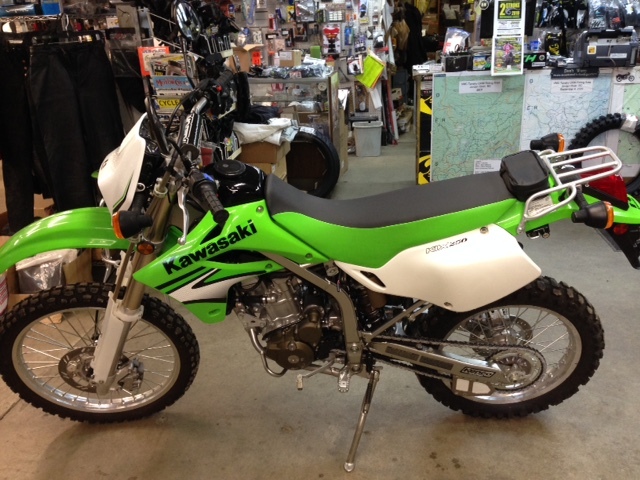 Aggressively styled in the same manner as Kawasaki's KX™ motocross machines, the KLX250S features a lightweight electric-start engine with a wide powerband and a lightweight, high-tensile steel perimeter frame. 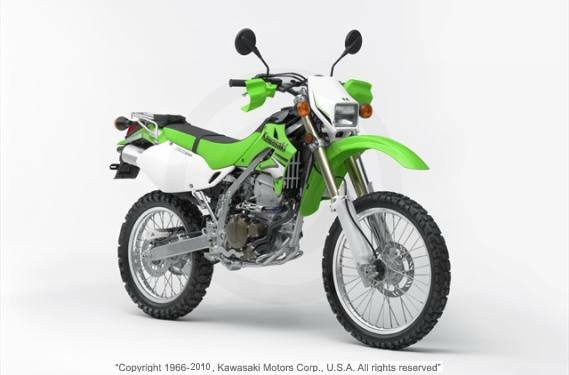 The KLX250S is powered by a compact, liquid-cooled, four-stroke, single-cylinder engine displacing 249cc. The engine is mounted towards the bottom of the perimeter frame, helping to deliver a low center of gravity and enhanced maneuvering on tight trails. A gear-driven engine balancer helps reduce engine vibration for greater comfort and less fatigue on longer rides. The rigors of off-road motorcycling dictate additional protection for the exposed underside of most machines. The KLX250S comes standard with aluminum engine guards to protect the crankcase during off road adventures. A throttle position sensor (TPS) helps the 34mm semi-flat slide Keihin CVK carburetor deliver the optimum amount of fuel for all riding conditions. This contributes to improved responsiveness and power, as well as increased fuel economy to help battle higher gasoline prices. Riders will notice the 26.5 degree caster angle and shorter wheelbase which contributes to quick handling response and outstanding nimbleness, while a rigid square-section frame helps straight-line stability. The Uni-Trak® rear suspension offers 11 inches of travel and 16-way adjustable compression damping for excellent bump absorption in rigorous off-road situations. Up front, 43mm inverted cartridge-style front forks come with a 16-way adjustable compression damping and offer 11.2 inches of travel. Ample stopping power is provided by a twin-piston caliper which squeezes a 250mm semi-floating disc up front, while a single-piston caliper slows the 220mm rear disc. Riders seeking enduro handling and modern engine performance in a dual-purpose motorcycle designed for effortless street riding will find it at their local Kawasaki dealership. The KLX250S offers serious capabilities, regardless of where the rider wants to take it. Front Suspension / wheel travel: 43mm Inverted Cartridge Fork with 16-Way Compression Damping Adjustment / 11.2 in. Rear Suspension / wheel travel: Uni-Trak® with Adjustable Preload, 16-Way Compression and Rebound Damping Adjustment / 11.0 in. 43mm Inverted Cartridge Fork with 16-Way Compression Damping Adjustment / 11.2 in. Uni-Trak® with Adjustable Preload, 16-Way Compression and Rebound Damping Adjustment / 11.0 in.